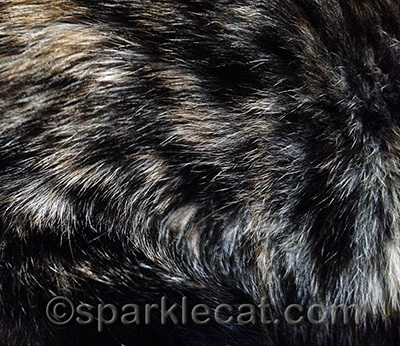 You are here: Home / Diary / Timid Tortie Tuesday? 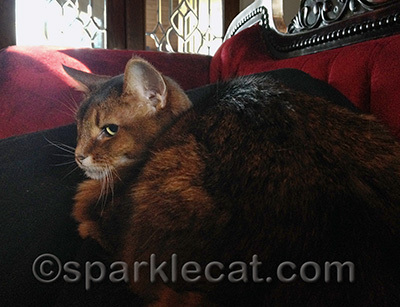 Why is Binga sitting by the edge of the sofa, looking worried instead of jumping on top of my human? Here is a clue in the bottom right hand corner. Can you see? That’s right — I am already there and I am in no mood for tortie shenanigans! Not that that stopped her for long. 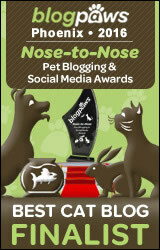 I think it’s time to see if smacky paws speak louder than stink eyes! I hope my human wasn’t planning on a nap. Don’t underestimate a tortie too much Sparkle, Ms. Phoebe was able to give the stink eye AND engage in smacky paws with her brother Kaspars! I know Binga is always photobombing you though, so lap bombing your human is probably just too much of tortie shenanigans for you to take. Maybe there’s enough of your human for both of you? Even if it puts her in a position where she cannot move, see, or breathe too well, nevermind that she will be okay. Poor Binga can’t win. It’s no contest with Sparkle! We say smacky paws, yeah smacky paws! Meowma says stink eye, only because she is so good at it. Luckily her lap only belongs to me. Oh how I love being an only cat! That’s a proper unimpressed look!! Oh this is the first time I’ve seen Binga a little quiet. Binga girl you have captured our mom’s heart. She loves you too Sparkle. It does my heart good to see Binga showing you some respect. Oh, and Sparkle? I saw that XXOO on my Valentine from you today and swooned a little. I mean, I know you’re not a romantic kind of girl, but you must like me a little bit, right? A boy can dream, can’t he? I guess she wasnt worried enough to NOT jump up there! Wow, and we thought Julie had a powerful stink eye! Did you two go to the same school? You may not need to bust out the smacky paws, Sparkle. That stink eye is FIERCE! I forgetted to tell you we gotted our valentime today..I help open it and everykitty got to look at it and sniff it..Mom said it wasn’t hard to open the lolly cause the mail personal was nice enough to pulverize it for us.. 😉 Anyhows thanks for it Sparkle, Binga, Boodie and Miss Janiss..we likes Hello Kitty..
Whoa, Sparkle….that is one intimidating look on your face. Scared me, and I am a he-man power cat! aw, what a sweet look on Binga’s face 🙂 your look, on the other paw, Sparkle, is deadly 😀 That sure is a familiar scene, though. Our Minnie has no qualms when it comes to rousting Smidgen off of our mom. I can tell you mean business Sparkle. You are both so cute. Ooooh boy. That’s a look. Seriously scary. Sometimes, you just have to Escalate. You know? 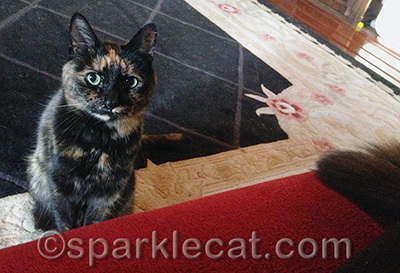 You look extremely perturbed Sparkle but it IS Tortie Tuesday afterall. Sheesh! Sparkle, did you get your way? I hate it when other cats disturb me. Oh but that first photo of Binga is soo sweet! 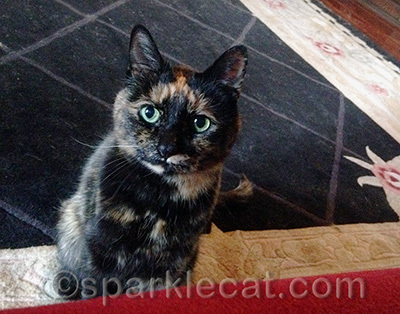 Binga has SUCH an expressive face, Sparkle! Then again, you do too, with that stink eye going on! The stink eye never works that good around here either! A Smacky-Paw fight while ON yer Bein? That should get an innerestin reaction. Peace and love I would say 😛 Binga looks so sweet ! Looks like a very effective stink eye to me! Smacky paws trump the stink eye every time. That doesn’t mean you can’t combine the two for even more impact. Fight! FIGHT! Go Sparkle! Smacky Paws rule! Sparkle Smacky Paws are probably pretty scary! You do look very cute in that first pic, Binga! Let the smacky paws begin! Our money is on you, Sparkle! Don’t hurt Binga too bad, okay? 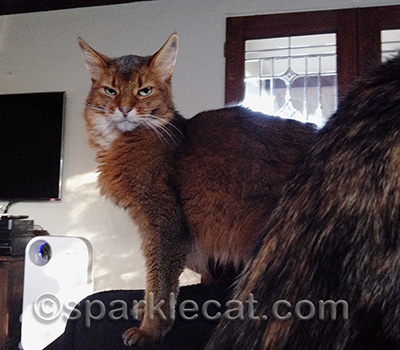 Those stink eyes should work with Binga but maybe she needs a little reforcement.You were there first. Have a great day. LOL! 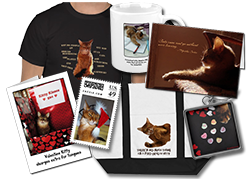 Smacky pawsâ€¦good one! I hope this ended with both of you sharing the human! MOL Sparkle are you saying 3 is a crowd? Uh oh! Some tortie is gonna get it! What a cute expression in that first photo of you, Binga! Oh dear, we can see you mean business. Maybe Binga will keep her distance?!? We think you’ll have to wait a while before you can jump on your human Binga.